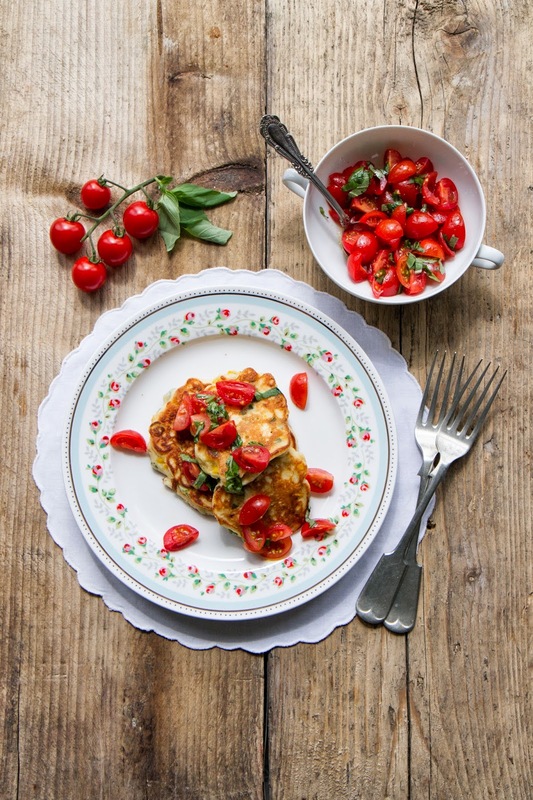 In our current issue, we asked Anne from Anne’s Kitchen to share some of her favourite spring recipes from her current book with us and she had our mouth watering with these yummy corn fritters! “I like preparing mine with ricotta, which makes them really light and fluffy. This is also great as a light lunch, in which case I’d serve a few rashers of crispy bacon on the side,” says Anne. - Start by making the salsa: wash the cherry tomatoes, cut into quarters, add the lemon juice, olive oil, basil and season with salt and pepper. - For the batter: Separate the egg yolks from the whites. Beat the egg whites until stiff. Put the egg yolks into a big bowl, add the ricotta, flour, butter and mix. - Trim the spring onions and cut into fine slices. Add the spring onions, sweetcorn, chili, salt and basil to the ricotta batter and mix. Then fold in the egg whites with a spoon. - Heat a tablespoon of oil in a large frying pan. Once it’s hot, make four fritters by dropping four times two tablespoons of the batter into the pan, frying them for 2-3 minutes on each side. Repeat with the remaining batter. - Serve the fritters with the tomato salsa.